I used to worry about money constantly. I was gripped by the fear of poverty, and not having enough money. But that is quickly becoming a thing of the past. My mindset is transforming from scarcity to abundance. In this article, I’ll share what I’ve discovered, and my journey to overcoming my fear of not having enough money. Before we begin, remember: This isn’t about how the digits in your bank account line up. This is about how you relate to money. A worry is a thought that we believe. When we believe a thought, we think we have to do something about it. If I have a thought that says I don’t have enough money, and I believe it, I will act as if it’s true. We see life through our thoughts. We feel the thoughts we focus on. That is why a rich man can feel poor, while a poor man can feel rich. So we’re not dealing with an entity that forces you to feel like you don’t have enough. We’re dealing with thoughts and beliefs that tell us that we have to worry, otherwise we’ll end up homeless or worse. The reason we worry is because we believe it’s beneficial. Believe is the key word. Worrying feels like something we have to do. Our whole being tells us that if we don’t worry, we won’t survive. The key is seeing through this illusion. This is how beliefs work; they make it seem like you have no choice. If you’ve worried for a long time, then that thought pattern has become a habit. It has become familiar to feel anxious about money. It can be transformed, but you have to make the choice to do so. So let me ask you: Are you ready to transform your relationship with money? It may not feel like you have a choice, because the worrying happens so automatically, but you have a choice. Up until this moment, you’ve kept choosing worry because you thought you had to. In the below video I share my take on how to stop worrying about money and poverty. After you’re done watching the video, read the rest of the article to dive deeper. As I said above: There are the rich who feel poor, and there are the poor that feel rich. Their thinking, their mindset. They have different habits when it comes to their thinking patterns. A large chunk of your experience of life is dependent on the thoughts you focus on. If I have a thought about not having enough money, and I focus on it, I get to feel like I don’t have enough. However, just because I feel like I don’t have enough doesn’t make it so. Now, I have a choice. Once that thought comes in, I can give in and entertain it, or I can nip it in the bud. I can be aware of it, but not get pulled into the drama. I can watch it, and let it be. That gives me a whole different experience. In time, as I fuel thoughts of worry less, they don’t come knocking as often. So this first step is about noticing how you create your experience of life. Notice that you get to experience what you think, but it doesn’t necessarily mean that what you think is true. “But Henri, I have bills to pay,” you might say. I’m not denying that you have bills. I’m pointing you to how you relate to those bills. You have a choice whether you want to worry yourself to death, or whether you take a more relaxed approach. Because you see, when you relax, you free up energy and creativity. That’s when you can do something about your bills, if there is something to be done. Below is a video where I dive deeper into this. Next, grab a pen and a piece of paper. Write down what you’re worried about. When you become aware of your own thought patterns, you start to catch them in the act. A powerful way to increase awareness of how you worry is through writing down your thoughts. The more you do this, the more you begin to spot patterns. In time, it becomes like watching a movie for the 100th time. It becomes old. The same story, over and over again. The exercise goes something like this: Each day, sit down for 10-15 minutes and write down every worrisome thought you have. Explore what’s going on, and put it on paper. This is similar to Morning Pages from Julia Cameron. What can I do about this, right now? Why do I have to worry or think about this? What can I do if that worse case happened? If I were on my deathbed, what advice would that future me share now? Pay attention to how your mind tries to pull you into the same story you’ve fallen into in the past. Notice how you feel fear because you pay attention to a story, a thought, in the theater of your inner space. This next step is about emotional acceptance. One of the reasons why thought patterns persist is because they have an emotional charge. That emotional charge is there because you have a cluster of thoughts that support each other. They’ve built a small community of scarcity to convince you that you need to feel bad, afraid, and anxious. Now, if you want to learn how to stop worrying about money, you have to learn to feel your emotions fully. Feeling your emotions fully helps you look beyond labels of good and bad. When you let emotions dance in your body, they eventually run out of steam. Personally, I start by noticing what I’m feeling and where it is. I then open myself to it. I accept it. I let it expand. I welcome it in. If you’re anything like me, you may have a natural resistance to emotions. You may try to stop yourself from feeling them. If that’s the case, all you have to do is to stop resisting, and feel the emotion. It may feel scary at first, but you’ll soon find it exhilarating, because you realize that there is nothing to fear. If you feel especially daring, go to the worst case scenario. For example, if you’re afraid of being homeless, imagine that, and try to amplify it. Then notice where the emotion is, and feel it fully. As resistance and thoughts pop up, include them, and keep feeling everything. If you want more detail, below is a video on how I do this. So you’ve learned how your mind works, to identify your thought patterns, and to feel your emotions fully. Now it’s time to live in the present moment. What does it mean to live in the now? To me it means being mindful, which means being aware of your body, your mind, your surroundings, and the space between all things. I’ve been practicing living in the now since around 2006, when I bumped into the Power of Now by Eckhart Tolle in a small bookstore in Bangkok, Thailand. So it’s taken time for me to become anchored in the present moment. How does living in the present help you transform your scarcity mindset? When you’re mindful, you notice when worry pops up. You notice when your mind starts telling you the same old story about why you must worry. As that happens, you can be present with it. Today, I’m able to catch myself before I spiral down into the depths of worry. I know that my mind doesn’t know everything. I know that I don’t have to be afraid of my thoughts. This doesn’t mean I don’t have anxious days, because I do. It just means that I’m less likely to panic over them. I know they will pass. I know they’re a part of the human experience. Below is a video of mine where I go deeper into how to live in the present moment. You experience life through the thoughts you focus on. You can explore your thought patterns, and eventually see through how your mind tries to pull you into acting out of fear. You can feel your fear fully, and it eventually dissipates. And you can live in the present moment, and catch yourself before you spiral down into the world of worry and anxiety. Don’t feel like you have to apply everything from this article. I suggest you take the step that resonates with you the most, and play with it. As you take action, life brings you what you need. This is the beginning of a new way of relating to money. Are you ready for it? P.S. 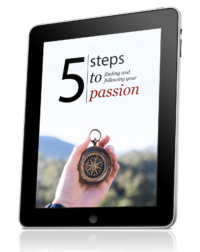 If you’d like to take the next step and start living your passion, I invite you to check out my popular book, Find Your Passion: 25 Questions You Must Ask Yourself. 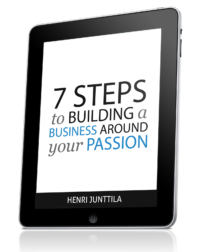 Great article, Henri. You explain with such simplicity and clarity. Resistance is the issue, right! Letting go, acknowledging confuses people, because they believe they have to accept the situation. It is a type of Mindfulness, which I teach. Dear Henri, thank you for the precious help. In my case I did happen to find myself without money in London for a series of unfortunate events. However, I did manage to survive and find my way home slowly. It’s been years since then and I’m still travelling around the world with very little money because I treasure every little thing I can have such as a healthy vegan meal. The security of a life of routine was killing my spontaneous joy and I decided to hit the road again because despite all of our fears, I feel alive again. Sometimes, I do have doubts and fears but this happens when I feel weak, I mean physically tired. After a good rest everything starts to shine again to my eyes. Life is a reflection of what we are, thank you for reminding me of accepting who we are for what we are with the entire package. I’m in Cambodia at the moment and as they say here “Good luck to you!”, and they really mean it. So good luck to you and your family. I’ve downloaded your ebook and I’m going to read it as soon as I can! Thanks for sharing that, Antonella. There are hidden gems even in unfortunate events, if we are open to them. Good luck to you on your travels and adventures! a yoga membership, traveling and most importantly affording to have my own independent life. I can’t afford my own place and my Dad does the maintenance on and buys the parts for my vehicle. This makes me feel like such a looser! I also feel that I won’t find any one that would want to have a real relationship with me because of what I do for work and barely having enough money. I don’t want to have anyone else have to pay my way. This creates thoughts and feelings of being a looser and embarrassment! I want to thank Henri for this information on how to work with thoughts about scarcity. Thank you for your time reading my story! Thanks for reading, and sharing your story, Lori. I appreciate it, and I’m sure many others do, too. As always Henri your writing is right on the money, literally. You are showing people how to stand guard over their thoughts, and importantly how to get themselves out of negativity, stopping it spiralling out of control. The concept of living in the Now is so important too. Here was my former dynamic, I broke free once I recognized it.If I got fearful because I wasn’t making enough money or anything, what was really going on was that I was angry about the situation then I got fearful that my anger might get me in trouble..I don’t need that dynamic anymore.If I notice I am getting anxious I immediately suspect I am starting to get angry and I realize whats going on and I trust myself not to act on anger. .Anxiety ends.Another example I used to be fearful of public speaking about topics I wasn’t interested in,in school.I was really angry about being put in a position where others could judge me negatively, then I got scared of what trouble my anger could get me in.I used to believe I needed to be angry sometimes to take care of myself,now I know that’s not an accurate belief. That’s extremely insightful, Phil. Thanks for sharing. I’m sure your words will help many. Thank you for sharing this. It made me aware of my crippling worries, which I really have no reason to have. Great content as usual Henri, thanks.